The Freedom From Religion Foundation and the ACLU of Florida are urging the Florida state government to cancel an annual state-sponsored event that's suffused with religion. The two organizations have received multiple complaints about the annual Florida Faith Symposium, a conference co-sponsored by the Florida Department of Children and Families, the Florida Department of Juvenile Justice, and the Florida Faith-Based and Community-Based Advisory Council. The event is described as bringing "together more than 500 faith and state government leaders." The symposium includes invocations, speeches, workshops, and other programming that promote religion in general, and Christianity in particular. The 2016 event, the seventh year it's been held, included at least two invocations per day. Many of these prayers were not only religious, but were also sectarian, invoking Jesus specifically. Invocations were also delivered by several state employees. "The Establishment Clause in the First Amendment to the U.S. Constitution, and the analogous provision in the Florida State Constitution, prohibits government sponsorship of religious messages," FFRF Legal Fellow Ryan Jayne and ACLU of Florida Director of Legal Operations Nancy G. Abudu write to the Florida Department of Children and Families. "Scheduling Christian prayers during this event sends the message that the government agencies organizing and sponsoring the event prefer and endorse religion over nonreligion, and Christianity over minority faiths." In addition to religious invocations, several state actors who spoke at the 2016 event in their official capacities promoted religion, including Gov. Rick Scott and Department of Children and Families Secretary Mike Carroll. The U.S. Supreme Court has held that government officials may not seek to advance or promote religion, FFRF emphasizes. Scott's and Carroll's promotion of their personal religion during this government event — while speaking in their official capacities — sends the message that they, on behalf of the state of Florida, prefer and endorse the Christian faith. Finally, programming at the Faith Symposium often promotes religion in general, and Christianity in particular. For example, last year's event featured Christian recording artist Omega Forbes, whose "mission is to lead people beyond the veil and into the presence of the Lord." Additionally, the event's workshops regularly involve improper entanglement between religion and government, often tackling social issues from a religious perspective. For instance, one government-led workshop was titled, "The Love of Christ Bridging the Gap of Abandonment and Rejection." The separation of church and state is one of the most fundamental principles of our system of government. The state's elected officials are charged with representing all citizens, including those citizens who may not share their religious viewpoints. Holding a government-sponsored event that openly promotes religion sends the message to nonreligious residents "that they are outsiders, not full members of the political community, and an accompanying message to adherents that they are insiders, favored members of the political community," to quote the U.S. Supreme Court. "A state-sponsored affair with such a religious purpose and outlook is completely unwarranted," says FFRF Co-President Annie Laurie Gaylor. "If Florida wants to address social problems, it must do so in an inclusive and constitutional manner." FFRF and ACLU of Florida urge the state of Florida to replace the Faith Symposium with a separate, entirely secular event that would be open to all community leaders and still would benefit Florida's youth and families without entangling the government with religion. 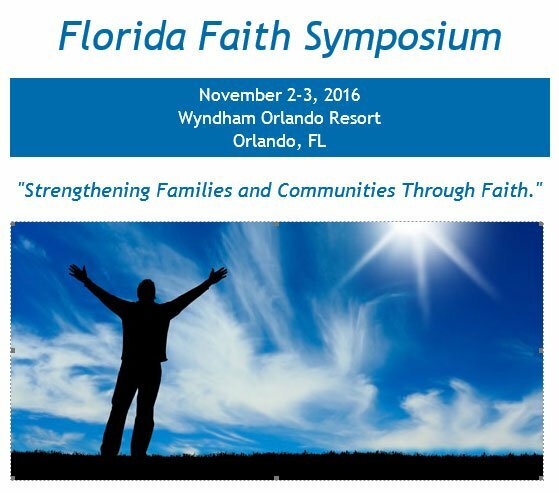 Absent this or a major overhaul of the event, FFRF and the ACLU of Florida will strongly consider further legal action to challenge the 2017 Faith Symposium, taking place Nov. 7-8, 2017, in Orlando. The Freedom From Religion Foundation has more than 29,000 nonreligious members and chapters nationwide, including 1,400-plus and a chapter in Florida.